Jute Tarpaulin 12` x 9`. Waxed (not waterproof) jute tarpaulin comes complete with brass eyele..
Jute Tarpaulin 15` x 12`. 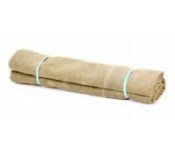 Waxed (not waterproof) jute tarpaulin comes complete with brass eyel..
Jute Tarpaulin 18` x 12`. Waxed (not waterproof) jute tarpaulin comes complete with brass eyel..
Heavyweight insulated tarpaulin designed to keep loads hot or cold throughout their journey. Co..
Tear-proof laminated tarpaulin, waterproof and treat UV filter for durability and extended servic..